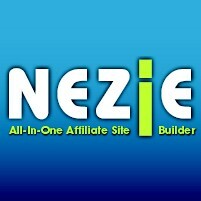 In short, Nezie.com is a full powered online affiliate store builder. Members can use this online tool to build unlimited niche affiliate stores with products from leading online merchants such Amazon, Zazzle, AllPosters and handpicked selection of merchants from the ShareASale and PepperJam Affiliate Networks. Members build stores by choosing the products and merchants they want to work with and adding their products to members stores. Members can add as few or as many products as they like and can change the templates and add html banners to their stores. We are constantly adding new merchants and affiliate programs into our store builder so our members can build great niche stores and maximize their earnings with their favorite affiliate programs. You make money by referring sales to the products you add in your stores. You earn referral commissions according to the payout scheme of the merchants products you add. For instance, you add posters from AllPosters.com to one of your stores. Your store visitor clicks on that poster and makes a purchase at AllPosters.com. You will earn 20% commission on the sale price of that poster becuase AllPosters pays 20% commissions on all referred sales. Each merchant have their own commission levels and you are paid directly from these merchants as their affiliates. You need to sign up with the affiliate merchants you want to work with and add your affiliate ids in your store admin section. Nezie.com does not hold, process or touch your affiliate earnings in any way. Your affiliate ids are used to identify you as the referrer when your store visitors make a purchase through one of your affiliate merchants. If you are a Pro Member, every visitor who visits your stores will be viewing all the products tagged with your affiliate ids all the time. If you are a Free Member, 7 out of 10 visitors will be viewing all the products with your affiliate ids and the remaining 3 visitors will be viewing products in your store tagged with Nezie.com affiliate ids. Additionally, store owners can generate more income by easily adding Google Adsense to their stores and also incorporate html affiliate banners where they can extra affiliate commissions. Fill in all the required details including your affiliate ids. Thats it! You will now have your first store created with the products you chose. Create as many product categories as you like and fill your niche stores with as many products from a variety of affiliate merchants. Drive traffic to your new store and see the sales and commissions come in directly at your affiliate merchants website. There are two types of membership levels at Nezie.com - free and pro membership levels. All the functions and features are the same for the two membership levels except for the commission sharing structure. Free members get to use all the provided features and functions at Nezie.com. However, they will share in affiliate traffic of their stores. For the remaining 30% of the time, free members share their traffic with Nezie.com affiliate ids. Pro Membership includes all the functions and features of the free membership level and pro members get to keep all the affiliate traffic their stores get. Pro members affiliate ids are used 100% of the time on all their stores. Pro membership costs US$ 19.95 monthly. Nezie.com is live now and you can register and start creating your sites in the next few minutes. Register for your free account now! Just use the contact form on our website to contact us. That is the fastest way for us to notice your request and get back to you. Rajays, I have started a store now and just have a couple of questions. What is the best way of contacting you guys with questions? I left a message on the blog but I don't know if there is an actual help form to fill out? It is an amazing site! Loving it already! Wow! This is very cool. I have signed up and now am trying to decide what to make my first store about. I have some ideas but not sure which one to use first. Thanks for introducing this to the community! This sounds really cool! I will be creating a store. Thanks for the great comment and feedback. I really appreciate it. We are currently working on several add-ons and modules to make Nezie even more powerful and seo friendly. Please let me know what other features you would like us to add to the system and we will try to work on it asap.